This is a very simple card that is made from one piece of patterned paper and one scrap of black cardstock. The brown paper with the floral scene on it is from Prima’s Engraver collection. It’s pretty on its own, but lacks the punch to carry an entire card design so I added some flowers to a few of the printed stems. 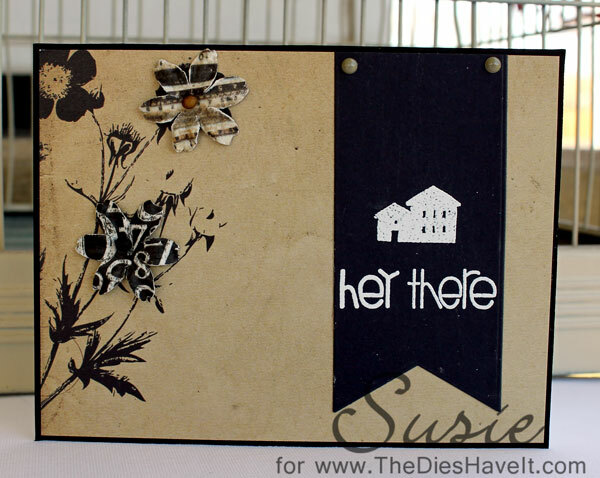 The sentiment and little houses are from the Paper Smooch's Sentiment Sampler. I used bright white embossing powder against that black banner and it really does pop. I could have cut the banner by hand, but instead used a die from MFT Stamps. Much easier! I hope you'll be back tomorrow so I can show you another fun Pink Elephant challenge layout.